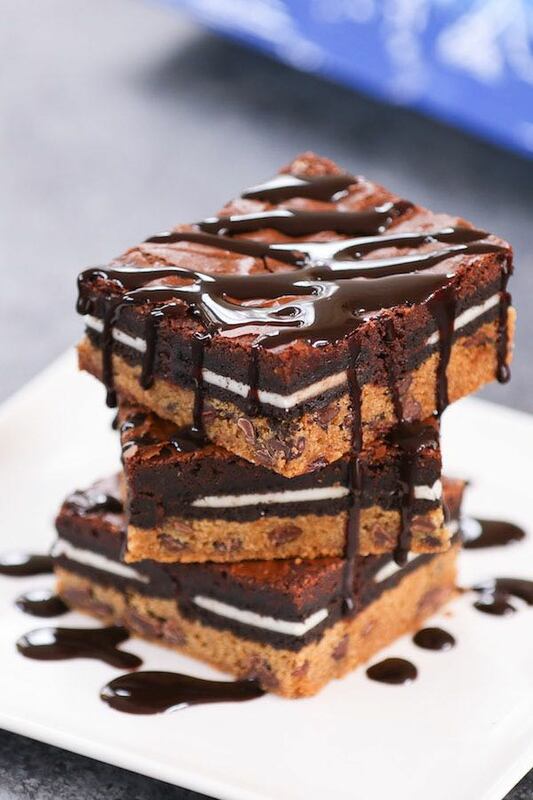 These Slutty Brownies are the ultimate decadent dessert combining chewy chocolate chip cookies, soft Oreos and moist brownies, then drizzled with your favorite toppings. 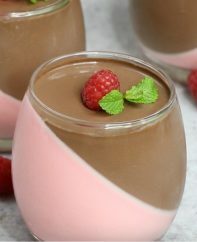 So good and easy to make. Plus video tutorial! Slutty brownies are a chocolatey dessert sensation – the perfect fancy but easy sweet treat. The best part? The oreos soften up during baking to become super-moist, melting in your mouth… Can you say yummy! They’re one of my fave desserts together with Oreo Balls, Fried Ice Cream, Clafoutis and Fried Apple Pies. Slutty brownies are not sold anywhere for obvious reasons, so you have to make your own to get your fix. They’re so fun to serve at a party or on game day, or just for a late night snack. 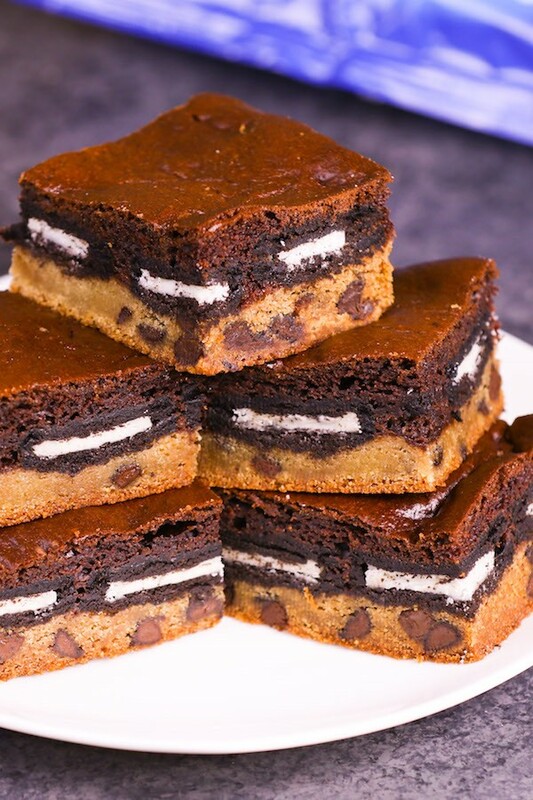 Slutty brownies are a 3-layer treat with cookie dough on the bottom, Oreo cookies in the middle and a brownie layer on top. They’re also called by the more family-friendly name: Oreo cookie brownies or cookie Oreo brownies. But what’s the real story? Jessica Simpson called slutty brownies her biggest pregnancy craving on Leno years ago. When asked why they’re called that she said “I don’t know, I guess a lot goes into them?” Let’s just say the term stuck! 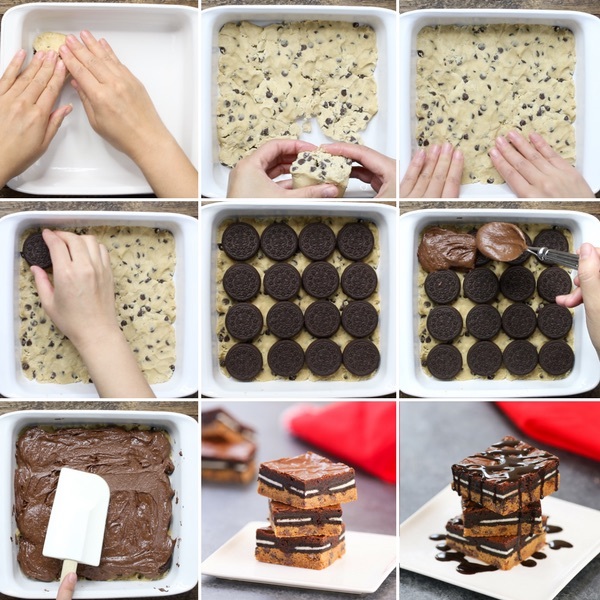 To make slutty brownies, start with a square 8-inch pan for a single recipe or a 13×9 pan for a double recipe. Then line the pan with parchment paper. You can also spray the pan with nonstick baking spray or line the pan with foil, but I find lining with parchment paper is the easiest way to get the brownies out of the pan after baking. As there are 3 layers in slutty brownies, I will explain how to make each layer to achieve the best results. Cookie Dough Layer: You can use store-bought chocolate chip cookie dough from the refrigerated section of the supermarket, or make your own with our homemade chocolate chip cookie dough. Start by pressing 16 ounces of chocolate chip cookie dough into a single layer about 1/4-inch thick on the bottom. Make sure to press down firmly and form an even layer. 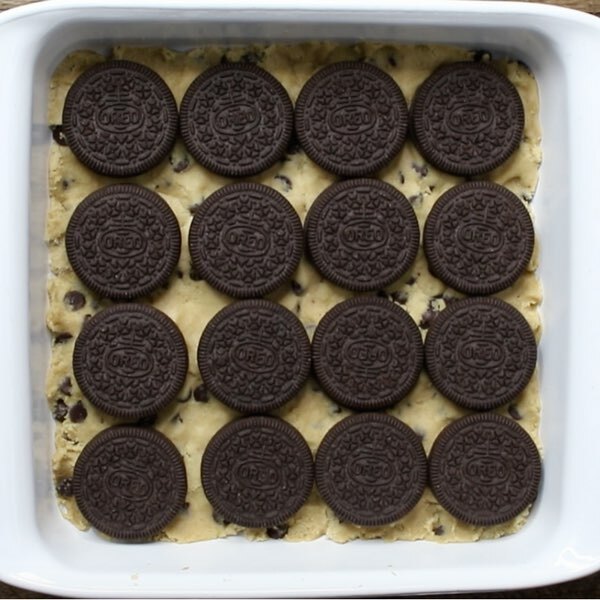 Oreo Cookie Layer: The next step is arranging the oreos side-by-side on top of the cookie dough. For an 8-inch pan, 16 cookies fit snugly with a bit of room around the edge. If you use a different size pan, just lay as many oreos as possible, making sure there’s no overlap. If there is extra space on the edge, you can break the oreos in half to fit into the pan. You can use any kind of oreo cookies for this recipe, including double stuf, oreo thins, red velvet, mint etc. Even store brand cookies and cream cookies will work. There look and taste will vary sightly, but it will still be a slutty brownie! 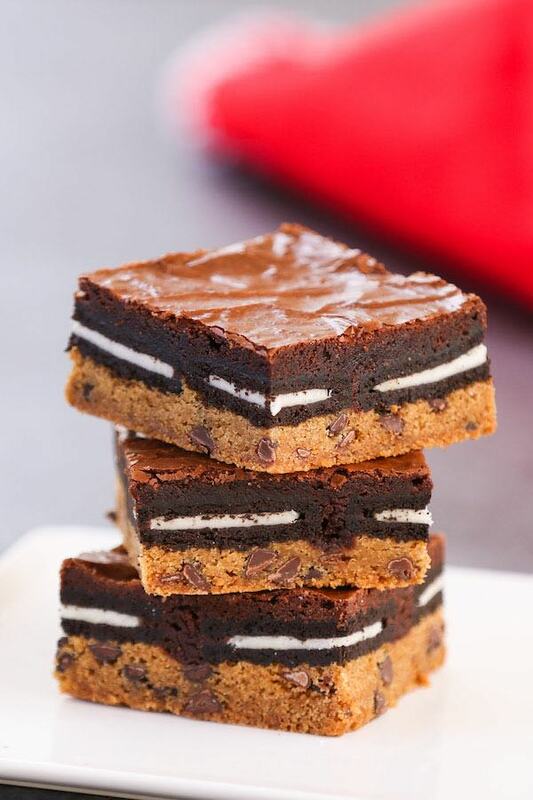 Brownie layer: The final step before baking is adding brownie batter on top of the oreos. You only need about half of what an 18-ounce brownie box makes, just enough to cover the cookies evenly. If you want to make an entire box, use the leftover to make brownie cupcakes in a muffin pan. After you finish all 3 layers, it’s time to bake! Bake slutty brownies for 30-40 minutes in the lower third of a 350°F oven. Baking for 30 minutes will produce a wetter brownie, while 40 minutes will make a cake-y brownie. Slutty brownies are done when the center has puffed up slightly, and a cake tester inserted comes out clean, indicating the brownies are cooked through. The brownie layer sometimes deflates slightly as it cools, which is normal. You can either serve slutty brownies right out of the oven or let them cool. However, bear in mind that the results are totally different! Served warm: Cutting them straight out of the oven can cause a partial collapse, so you won’t have the clean look like in the photos here. They still taste amazing, however and trust us that nobody will even notice if you put some ice cream or chocolate sauce on top. Served cool: Let the slutty brownie sit at room temperature for about two hours after baking. Then lift the edges of parchment paper. The brownie should be easily come out without collapsing. 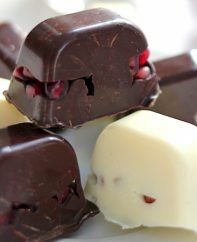 Then use a sharp knife to cut them into squares to get a clean and beautiful look shown in this post. If you use store-bought brownie mix, don’t pour all the batter into the pan. You only need enough to cover the oreo cookie layer, or about half of the batter. If you want a clean square cut of slutty brownies, let the brownie cool in the pan completely before slicing with a sharp knife. 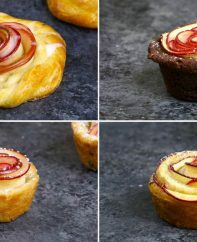 To test whether they’re ready, insert a toothpick or cake tester in the middle; if it doesn’t come out clean, bake for 5 more minutes before testing again. Slutty brownies can be made ahead of time. You can freeze them for up to a month in a ziplock bag or airtight container. Salted Caramel: Microwave the caramel sauce for 30 seconds, and then use a spoon to drizzle it over the slutty brownie squares. Sprinkle with a few grains of salt or fleur de sel. Ice Cream: Scoop your favorite ice cream and serve on top or on the side – it’s so good! Chocolate Ganache: Heat 1 cup heavy cream for 40-60 seconds until hot. Add 2 cups semisweet chocolate chips and stir until smooth. Pour over cooled brownies and set for several minutes. Are the Oreos Crunchy in the Middle? No, the oreos in the middle become moist and soft during baking, making these treats so irresistible! 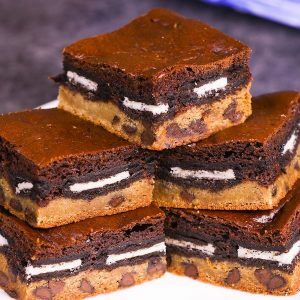 These Slutty Brownies are the ultimate decadent dessert combining chewy chocolate chip cookies, soft Oreos and moist brownies, then drizzled with your favorite toppings. So good and easy to make. Preheat the oven to 350°F degrees. Line an 8-inch square baking pan with parchment paper and and set aside. 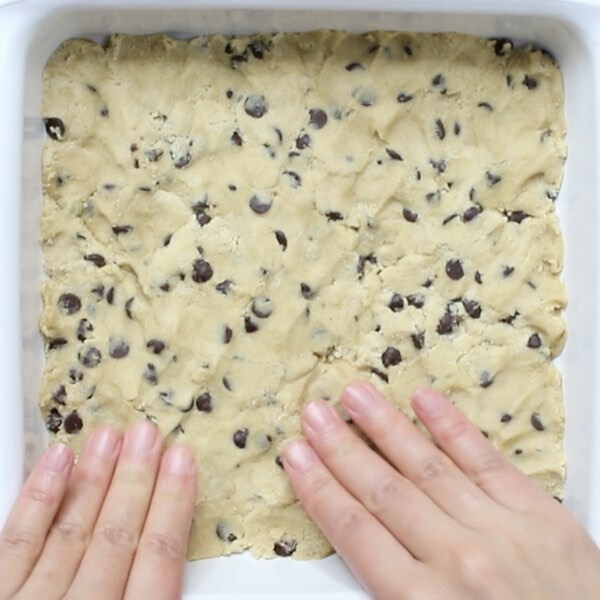 Press the cookie dough into a single layer in the bottom of the baking pan. 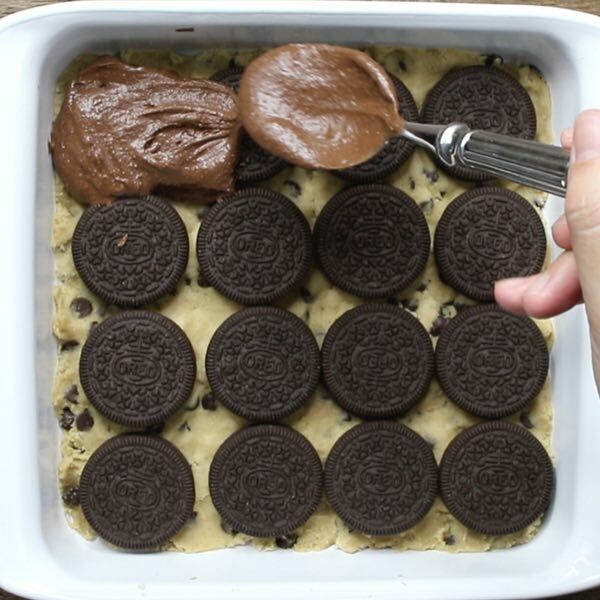 Arrange Oreos in a single layer on top of the cookie dough. Make the brownie batter in a medium bowl according to the package directions. Pour brownie batter on top of the oreos, spreading out with a spatula to evenly cover the oreos. Bake for 30-40 minutes until a toothpick or cake tester inserted in the middle comes out clean. Cool in the pan for at least 1 hour. Serve and enjoy! Editor’s note: Updated July 7, 2018 with additional details and photos. This was the easiest tastiest dish ive made all summer? Does the baking time change when making a double batch in the 13×9 baking pan?? I’ve made these about a dozen times, usually in a 9×13 pan. If you make half the recipe in a smaller pan you may want to shave off 5 minutes. The real test is sticking a toothpick (or, since it’s 3 layers and rather thick, try my trick and use a spaghetti noodle instead) into the middle. What you’re looking for is a bit of crumb clinging to the stick–not wet but not completely dry. Good luck! Pay special attention to the amount of cookie dough. I used too much and it was a disaster. Add a salted caramel layer over Oreos, sprinkle w chopped nuts. Once baked, set up in fridge, cut into small squares,then freeze. Then dip, to completely coat, into melted chocolate candy coating, I use Ghirardelli. Let set up. Awesome. I am so intrigued. I will definitely try. I also want to try a peanut butter or sugar cookie dough version with vanilla Oreos and salted caramel or blonde brownies. Love, love, love this recipe. So easy and delicious. Thank you TipBuzz. I have Rockstar status with the family. Hi Jenn, You can store them in a ziptop bag or airtight container to stay fresh. No need to refrigerate just like regular brownies. Enjoy! How did you cut them so perfectly? My brownies always crumble or big chunks come off with the knife. The photo shows such clean cuts – perfectly cut brownies. Look amazing! Thank you!